So it's been a bit of a mad week. I cannot believe we are at Friday again so I thought I'd sit for a minute and catch up with myself. On the blog natch. I completed the first week of my new job in a communications role (self employed still but regular income which is awesome.) I had some moments when I began to wonder if I had been out of the "proper" workplace for too long but as I get used to the software, the PC (I'm a mac girl) and my copious notes I'm sure it will be fine. It raised questions as to how hard it can be to work with an invisible condition like Fibromyalgia. My brain fog seems much more apparent now I really HAVE to remember stuff so I have developed a system involving two notebooks which I hope will serve to prompt my memory. No more remembering things in the middle of the night then fretting until it's a reasonable time to head for the office hopefully. The inflatable hot tub has proved invaluable for my stress and the children's entertainment. Even on a day which was not really paddling pool weather, we all got into the lovely warm water. On Sunday we went along to a local church's Strawberry Tea. 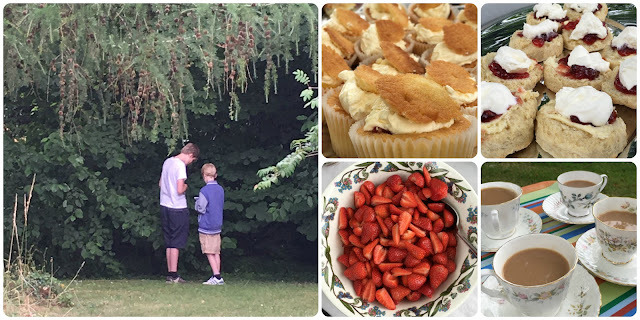 Lots of yummy homemade cake, a constant stream of tea and some unexpected Pokemon catching opportunities in lovely surroundings. I visited my son in Portsmouth with a friend and indulged in a bit of shopping at Gunwharf Quays. Not exactly the last of the big spenders, I bought a hairbrush for my daughter and a fleece for my youngest. You can see from the picture he was very pleased with it. It's very soft! I was disappointed to learn that some of the stores at Gunwharf Quays are being asked to leave the development to make way for "higher end" brands. A £800 handbag at £300 from these type of shops might be a bargain for some but not me. Oh well. It's still an awesome venue right on the seafront (estuary?) for a coffee, lunch or some window shopping if you don't have the sort of budget which means you moor your yacht while you shop. You could always do as I do - wear nautical stripes and pretend you have a yacht. This would also be a great outfit for Port Solent where we enjoyed a nice cuppa with a view of the marina - I loved the tea cosy! There was of course more fun with friends - shopping, chat, lunch, coffee drinking, fruit cooler drinking (with the inevitable brain-freeze.) and the children have ridden bikes, caught Pokemon, explored a new (to them) playground, played Minecraft and had a variety of sleepover adventures. So thats the end of week two with lots more fun ahead - BBQ's, bubbles in the bubbles, a school activity week for one of the children and a McDonald's Fun Day for the rest. I'm hoping the weather stays quite stable!